I personally love these squares – the soft, cookielike dough surrounds a moist centre of seasonal rhubarb and the overall look is one of a very attractive tart. It is easy to cut into pieces – you choose the size of the squares and the final look to these! It is also OK to add in some strawberries for delicious strawberry-rhubarb squares! Grate rind of orange, set aside for pastry. Juice orange into a saucepan, then combine the orange juice, rhubarb, sugar and salt. Simmer over medium heat until thick and mushy – about 15 minutes. Mix cornstarch with 3 tablespoons of wter until dissolved, stir in rhubarb mixture and simmer for couple minutes longer. In food processor, mix together butter, cream cheese, sour cream, orange rind, vanilla and eggs until smooth. Add flour mixture, process just until dough forms loose ball. On lightly floured surface, knead dough until smooth, about 30 seconds, divide in half and form 2 discs. Roll out one disc dough into a rectangle large enough to fit bottom of the pan plus about 1/2 inch on each side. Fit into the bottom and up sides of prepared pan. Spread almonds over dough, cover with rhubarb mixture. Roll remaining dough into rectangle about 1/4 inch thick. 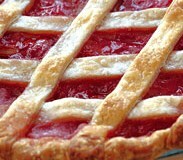 Using pastry wheel, cut into 1-inch wide strips; arrange in lattice4 pattern over rhubarb mixture. Hope you enjoy this recipe – if you decide to add strawberries,. cut them into smaller peices and cook together with rhubarb for the last 5 minutes of cooking time. Let me know how this recipe turned out for you – your input is always very much welcomed and appreciated!